U Can't Anvil The Truth: Anne Frank Deception And Trick-Or-Treater's Statement Of Your Choosing!! Anne Frank Deception And Trick-Or-Treater's Statement Of Your Choosing!! Holocaust. Her diary, The Diary of a Young Girl, which documents her life in hiding during the German occupation of the Netherlands in World War II, is one of the world's most widely known books and has been the basis for several plays and films. Amsterdam by the German occupation of the Netherlands. As persecutions of the Jewish population increased in July 1942, the family went into hiding in some concealed rooms behind a bookcase in the building where Anne's father worked. been saved by one of the helpers, Miep Gies, and his efforts led to its publication in 1947. It was translated from its original Dutch version and first published in English in 1952 as The Diary of a Young Girl, and has since been translated into over 60 languages. The diary, which was given to Anne on her thirteenth birthday, chronicles her life from 12 June 1942 until 1 August 1944. On 28 October, selections began for women to be relocated to Bergen-Belsen. More than 8,000 women, including Anne and Margot Frank, and Auguste van Pels, were transported. Edith Frank was left behind and later died from starvation. Tents were erected at Bergen-Belsen to accommodate the influx of prisoners, and as the population rose, the death toll due to disease increased rapidly. Frank was briefly reunited with two friends, Hanneli Goslar and Nanette Blitz, who were confined in another section of the camp. Goslar and Blitz survived the war, and later discussed the brief conversations they had conducted with Frank through a fence. Blitz described Anne as bald, emaciated, and shivering. Goslar noted Auguste van Pels was with Anne and Margot Frank, and was caring for Margot, who was severely ill. Neither of them saw Margot, as she was too weak to leave her bunk. Anne told Blitz and Goslar she believed her parents were dead, and for that reason she did not wish to live any longer. Goslar later estimated their meetings had taken place in late January or early February 1945. Otto Frank survived his internment in Auschwitz. After the war ended, he returned to Amsterdam, where he was sheltered by Jan and Miep Gies as he attempted to locate his family. He learned of the death of his wife, Edith, in Auschwitz, but remained hopeful that his daughters had survived. After several weeks, he discovered Margot and Anne had also died. He attempted to determine the fates of his daughters' friends and learned many had been murdered. Susanne ''Sanne'' Ledermann, often mentioned in Anne's diary, had been gassed along with her parents; her sister, Barbara, a close friend of Margot's, had survived. Several of the Frank sisters' school friends had survived, as had the extended families of Otto and Edith Frank, as they had fled Germany during the mid-1930s, with individual family members settling in Switzerland, the United Kingdom, and the United States. The author of this hoax wanted you to know and if you are awake you can spot the obvious LIES in the name “Annelies Marie Frank. The whole Frank Clan is a hoax by the numbers. The truth of her existence was revealed when the hiding in concealed rooms decoded to the infamous 133 code.It war all wartime propaganda to forment sympathies to get Americans and other nations to Hate the Germans during World War II. 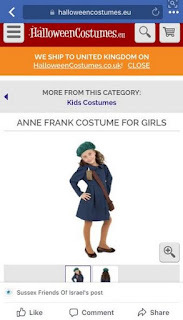 This Halloween truthers that know that the Holocaust and Anne Frank are frauds should make a statement by dressing your young trick-or-treaters in a ANNE FRANK improvised costume from old clothings. 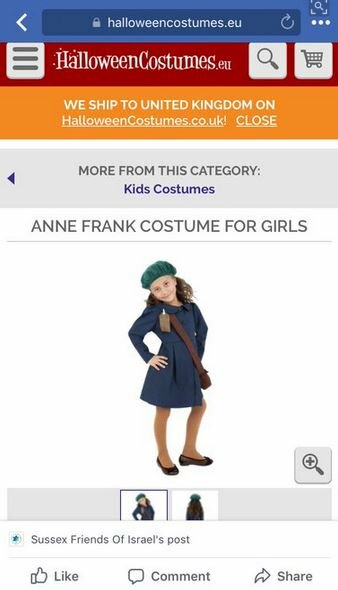 Any child can dress up as a replicated ANNE FRANK and probably nobody would know the difference. Make a statement and educate the Jewish Holocaust believer just how much they have been deceived and by whom!!! !